Were you ever in a conversation with a friend with opposing political views, and he or she would not accept even the simplest premise for compromise if it went against their ideology? Sometimes it is tough even to enjoy a beer under those circumstances. Why is it that despite all the logic in the world being on your point of view and the case you build, there are some people that would rather be way wrong than to accept it? If they think orange is a conservative color, it is the only color they dislike. Do you know people like that? If you told them the rich pay enough taxes, they would come up with nine million stories about how the poor are poor because the rich are rich. Their solution always is to make the rich, unrich, and make the poor, unpoor. I have another conundrum going on in my personal life this year and I am having two-way conversations with myself about an important matter. I am taking the side of me, and the other me is taking the side of what I expect from my liberal progressive friends. Yes, I have many of them as ideology and likeability are not the same. But, don't worry about me.... I'll work it out. In the meantime consider the fine American brews at the Menger hotel across from the Alamo. Tell 'em Teddy sent ya! 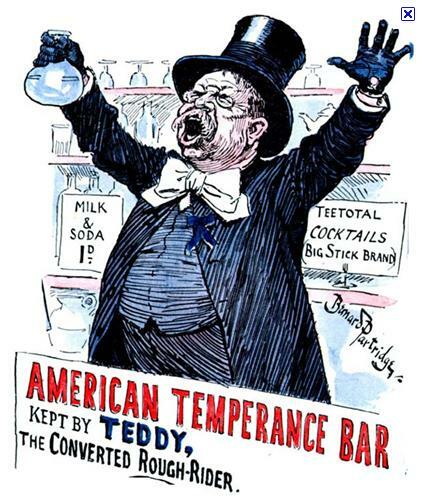 To have a drink with Teddy Roosevelt, a progressive for sure, but a man more concerned about equity than redistribution, all one has to do is visit San Antonio, Texas. That does not mean you must, like George Bush or RIck Perry, two Texans more concerned about big business than America, invite 1000 illegal aliens to have the drink with you, paid by you. Let them buy their own drinks --- in Mexico or parts south! The Menger cannot hold that many anyway! When you get to San Antonio, and you realize that the selfish curs who manage the City already sold most of the historic Alamo for downtown business projects, you will be sick to your stomach. When the malady ceases, you will quickly understand the big differences between conservatives and Republicans. You have learned on this site that I am an unproud Democrat with an attached attribute -- conservative. BTW, just go to the Menger bar, across from the Alamo, and you can whet yer whistles and not worry about taking any for the country like Bowie and Crocket, and Houston. Just whet yer whistle! This year is the first time I am on unemployment. I just passed all the hurdles, got my Debit card, and I am ready to collect. After seven years, having recently been promoted to Assistant Professor at Marywood University in Scranton, PA, 18503, I was informed that my contract would not be be renewed. It wasn't. As of May 1, 2011, I am unemployed. I say I am retired because I was even before Marywood. Actually, because my last day of work occurred long before then, I was eligible to collect since I work only eight months a year and am paid over 12 months. The fact that Pennsylvania denied me unemployment is an issue that I will not forget, nor would you in similar circumstances if, after paying for all these years, I was not permitted tocollect. My peers at Marywood originally told me that the candidates for my job as far as they had seen were legal foreign nationals, most probably with H-1B visas. Marywood does not care whether you are American or whether you are taking an American's job. They are all sponsored well by American companies that would prefer not to pay the full price of a qualified engineer or IT professional who graduated from one of our fine Universities. These are the best jobs in American and because Congress says it is OK, they are no longer American jobs. The visa holder can stay in the US for six years, which is typically enough time to get a green card and move on to citizenship. The point here is that these jobs, stolen from recent graduates to make them dependent, not demanding in their interviews with American corporations, are never placed back in a pool for which new American College graduates can compete. They are lost forever. America is the loser. Americans are the losers. To help ameliorate the American public, my fellow Democrats have made a glorious sacrifice regarding the 25-year old children who still live with their parents and who still have no jobs. Their sacrifice, as you may already know, was to add to Obamacare that they can be covered under their parent’s health insurance policy and cannot be refused. I admit this is necessary. But it is only necessary because the same Congress decided that legal foreign nationals can take the best American jobs and so there are many American college graduates who hit 30-years old and who still have not been able to get that first job. Let me say it differently. Those precious jobs have been given to people from India, China, the Czech Republic, or other foreign countries that train their youth to do well in American culture. If you are an American, you need not apply. Moreover, your government is on the other side of your opportunities for success. The bottom line is that our Congress has decided that it is OK to replace Americans with foreigners and even the adult children of my liberal / progressive friends are now unemployed because of this notion of diversity, they still don’t see it. By the way, diversity is an insidious decrepitude against all things American. In a land in which homogenization creates great citizens, diversity creates just the opposite. So that those who think we should highlight our differences in America can use cheap legal foreign labor, Americans who like the melting pot idea are left jobless by design. And the illegals actually get the leftover jobs that our College Graduates would have gotten if they were available. Even worse than how Congress treats American students who happen to graduate, they treat their professors even worse. Well, only if they are American professors. A little know fact is that Congress grants American Colleges and Universities as many visas as they need to replace as many American professors as they like. Whereas only 65,000 visas are authorized to businseses, over 200,000 new foreign nationals show up for work each year because there is no limit on University hires. Did I say that after seven years of fine performance, I was replaced this year by a person that my chairman chooses not to reveal. Eventually, somebody you know will be affected. Maybe it will be your son or daughter, (progressives and conservatives) who misses out on life’s opportunities simply because they are American. I regret to say that the fact that they might hold engineering or biotech, or info tech degrees from fine American Universities may work against them, even if they were at the top of the class. Valedictorians will have to work for less pay. Why? American law seems to favor foreigners today in the name of diversity. And progressives, who run the country today, believe that we all should make the same wage anyway, so who would expect them to suggest that the wage differential has any merit.? The message from Congress to the newly graduated in America: "Get accustomed to working for small wages." Perhaps I should praise the Congress for facilitating my being fired and I should praise Obama and company for placing me on the government dole. But, my father never taught me to think that way. I can talk to my relatives and my conservative friends and they get it. They see that a progressive government is not good for America or Americans who like to breathe free air and move about the country in an unrestricted fashion sans Obamaczar regulations. They know that as of May 2011, I will be unemployed because my government thinks it is better for Academic institutions to hire foreign professors than American professors. My progressive / liberal friends won’t fully get it. They cannot see what’s wrong because foreigners who would make less than Americans doing similar work are the sentimental favorites of the progressives. Progressives try to give the underdog more than the qualified. They see the same with illegal foreign nationals. These poor people, legal via the granted visa, who came here to take American jobs need help simply because they came here, even if Americans get hurt. I say when Americans no longer get hurt; when Americans all have placed on their oxygen masks, then all of us can take care of everybody else. But, some Americans deciding that other Americans don’t deserve a break because some foreign national may not get their job is a non sequitur for me and most other Americans. I can’t think that way. I think my family first, my country second, and my religion third. If I did not have a country like America in which to live, I couldn’t practice my religion freely so that is why the order is as it is. Progressives are concerned about themselves. Additionally, they “know” other progressives will take care of them regardless of what might befall them or the country in which they live. Progressives would ask if Americans have not had it too good for too long. They believe the well-to-do and the rich have not done their part, even though most of the hard-line progressives are rich and well-to-do. They ask, “why shouldn’t foreigners get a big break in America?” Of course, if it were them having to come up with clever ways to feed their family if foreigners took their jobs and the jobs of their children, they would not be quite as smug. A progressive in need with no help coming may come up with a more honest assessment of the situation, but I am not sure. The simple scoop here is that an American got fired and a foreigner was brought in specifically to take the American’s job. Is this good for America? If America disappears because we stop caring about Americans, what will take its place? I figure I’ll be fine on unemployment and the time off will give me a chance to fine tune my message for my possible Senatorial campaign. My wry sense of humor finds a striking difference between the affluent candidates for the Senate and the new me, on unemployment benefits for the first time ever. Will my progressive friends think that I was wronged or was it because I had un-confessed conservative thoughts and thus, I needed to be put in my place? Who knows? I cannot figure out why my best arguments go no-place with them. When they accept my arguments and offer a chance for America, I will have more hope. But, right now, I am convinced that they just don’t get it and even worse than that, progressives don’t want to get it. I titled this essay/ article, “....Will they ever get it?” because I am having my doubts. Drunk or sober, my progressive friends hold onto the same logic that makes Barack Hussein Obama a sure bet for one, two, or even three more terms. The czars can probably fire off a regulation that makes 6 terms the limit, and the Congress, just like on US energy, will abstain. This morning, however, I may have experienced the dawning of a new possible turnaround. I received an email that forces those who don’t get it, to get it. My preamble (everything before this word) may not be necessary for some but it is so frustrating trying to help anybody see something they refuse to see. I continue to wonder, but I am encouraged to receive things in my inbox that address the question, “Will they ever get it?” If the issue were “how do our taxes work,” hoping to convince a progressive they need to change, this email I received this morning does a pretty good job of that. If you are as frustrated as I about helping our progressive brethren understand the principles of life, maybe you too, will appreciate this. Please pay attention to this email from our friend Carsharp. So, that's what they decided to do. The ten men ate lunch in the restaurant every day and seemed quite happy with the arrangement, until one day, the owner threw them a curve. "Since you are all such good customers," he said, "I'm going to reduce the cost of your daily lunch by $20." Lunch for the ten now cost just $80. They realized that $20 divided by six is $3.33. But if they subtracted that from everybody's share, then the fifth man and the sixth man would each end up being paid to eat. So, the restaurant owner suggested that it would be fair to reduce each man's bill by roughly the same amount, and he proceeded to work out the amounts each should pay. Each of the six was better off than before. And the first four continued to eat for free. But once outside the restaurant, the men began to compare their savings. "Yeah, that's right," exclaimed the fifth man. "I only saved a dollar, too. It's unfair that he got ten times more than I got"
"That's true!!" shouted the seventh man. "Why should he get $10 back when I got only two? The wealthy get all the breaks!" The next day the tenth man didn't show up for lunch so the nine sat down and had lunch without him. But when it came time to pay the bill, they discovered something important. They didn't have enough money between all of them for even half of the bill! And that, ladies and gentlemen, journalists and college professors, is how our tax system works. The people who pay the highest taxes get the most benefit from a tax reduction. Tax them too much, attack them for being wealthy, and they just may not show up anymore. In fact, they might start eating overseas where the atmosphere is somewhat friendlier.